JPEG or PNG � Which Image Format Offers Better Quality? What's the Difference Between JPEG and PNG? With so many image formats available on the web, it can be really hard to choose one and stick with it. Each format seems to have a certain use, but some formats tend to be universal thanks to their small size as well as various compression capabilities. Some of the most popular image formats are PNG and JPEG, however each one of them has its own advantages and disadvantages. JPEG usually includes gray scale or full color images. A lossy, compressed image format, JPEG is suitable for those situations in which you want your images to occupy less space. Even if the images lose some of the quality after compression, this format is widely used on the web because it helps load the sites faster. This format can be used for anything from realistic images to photographs or designs, but people use them to store just about any image data. With complete support for 16.7 million colors, this format can showcase the best details in your images to reality. Unlike JPEG, PNG is a lossless compression format, so when the image is compressed there won't be any quality loss, which is very important. PNG is deriving from GIF, but it's much better to use. By converting a PNG file to JPEG you can save a lot of space, most of the time between 50-70%, which might be ideal if you are dealing with dozens or hundreds of images. However, if the focus is on image quality, PNG is certainly the best format. PNG also supports image transparency, which makes the images a lot more appealing and realistic. In addition to that, PNG is the best choice when it comes to icon graphics, line drawings or text in an image, because they are easier to distinguish and at a higher quality. Each time you re-encode a JPEG file you will lose quality, and after 10 or more compressions the image might become hard to distinguish, which can be problematic. Thankfully, you can't encounter such a problem with the PNG format. Both JPG and PNG files don't support animations; this is something you need to use GIF for. APNG (Animated PNG format) is not popular. Additionally, large JPG files can take quite a long time to load, whereas the PNG files load a lot faster, despite their larger size. There are also some progressive JPEG files and these preload in a similar fashion to the interlaced gifs. 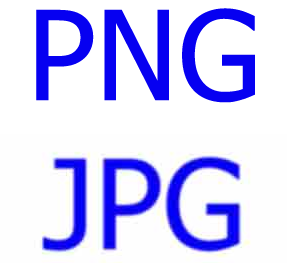 As you can see, both JPEG and PNG have their own upsides and downsides. While PNG is more suitable for the web, JPEG is still the preferred format when it comes to photos and digital art. In the end, it comes down to you to select the best format that suits your needs, but if you are in need of a higher even after compression, then PNG is the best choice you can make.